Fathima Group concern- Fairway General Trading LLC Dubai is hiring Customer Service/Sales executives for Dubai. About the Company : Established in 1973 in the Emirate of Abu Dhabi, the Fathima Group of Companies evolved at the pace of its regional environment through the years, with a particular focus on Modern Retail. Created by a humble and hard-working family, it is one of the oldest companies in the country which explains its excellent relationships with customers and the strong brand recognition of the group. * Customer Service/Sales preferably with minimum 2 years of work experience. * Age group preferably between 22 to 30 years old. * Must be graduate qualified and have an excellent communication and interpersonal skills. * Preference will be given to the following nationalities i.e. Arabic, Filipino, Indian and Sri Lankan. 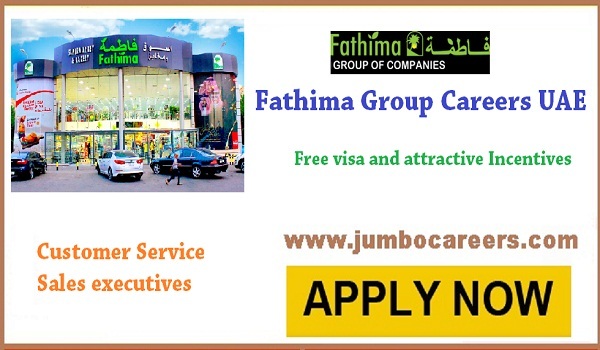 How To Apply For latest Customer Service Jobs in Dubai 2018. . Fathima group careers 2018? For Fathima group careers/ Fairway General Trading LLC jobs for customer service attend the latest walk in interview at below location. Venue : Fairway General Trading, Near Galadari Motor Driving Center, Al Qusais Industrial Area 4, Dubai. Note: Kindly contact above number and cross check for any final changes in interview schedule.